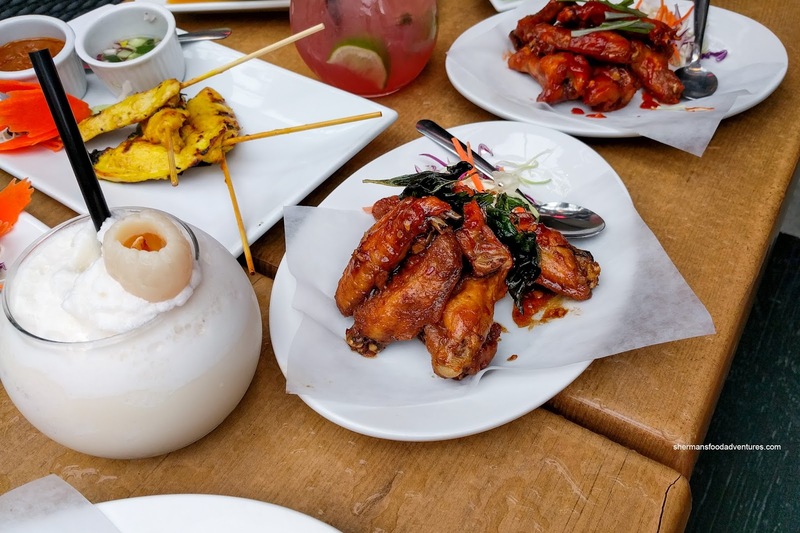 Is it just me or the elusive Happy Hour is becoming a thing in Vancouver? For the longest time, the happy hour options in the Lower Mainland were limited and downright pathetic. Finding an actual good deal on drinks and appies was as hard as finding a parking spot in Richmond. 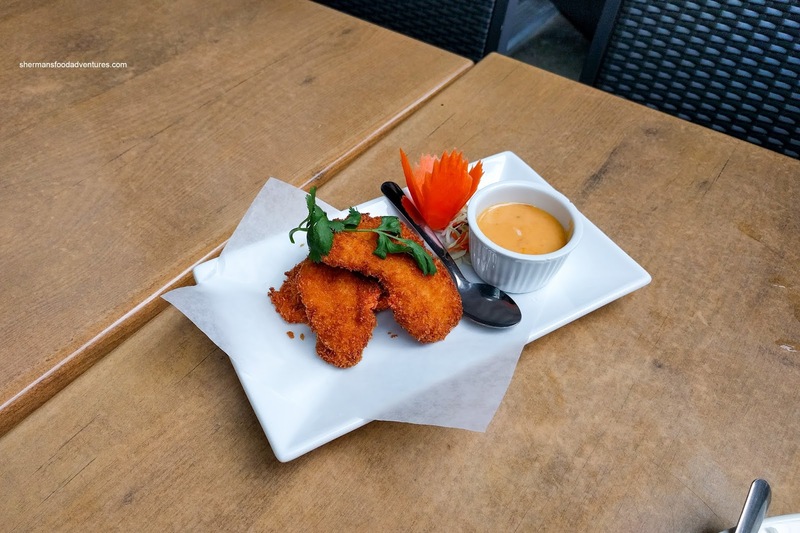 It appears that many restaurants have seen the light and are offering inexpensive beverages and equally reasonably-priced food to go with it. One of the best deals in town also happens to be one of the least-known. 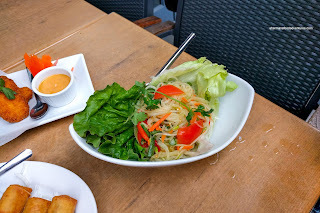 We were invited to Urban Thai recently to sample their happy hour menu (with items priced at $6.00-$8.00). We covered all the bases with the $6.00 items including the fantastic Thai BBQ Pork. 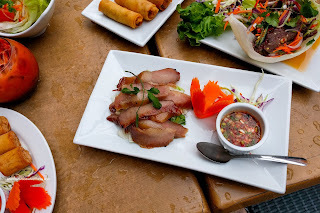 Completely caramelized with a smoky and sweet exterior, the slices of pork were delicious on their own. Loved the tender bounce texture as it had an addictive mouth feel. 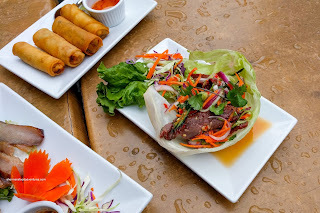 The sweet, tangy and slightly spicy vinaigrette on the side added bright flavours to the rich pork slices. Something more light and refreshing was the Som Tum Papaya Salad sporting crunchy julienned green papaya dressed in a tangy, sweet and purposefully spicy fish sauce dressing. Personally, I could've taken more heat, but we understood that this dish was meant for the majority of people. Onto something pretty standard, we had the Vegetable Spring Rolls consisting of the aforementioned veggies (carrot and cabbage) and vermicelli. 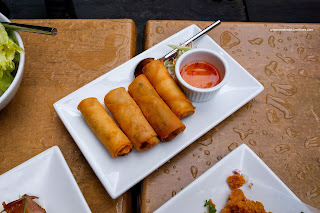 I've had the chance to make these before in an Urban Thai cooking class. They aren't very complex, but they do the job nonetheless. They were crunchy and easy on the grease. The filling could've used more fish sauce, but the side sweet chili dip solved that problem. 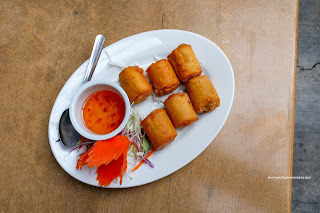 Looking very much like cut-up spring rolls, the Urban Thai Shrimp Balls were similar in exterior texture. Inside, it was a different story with sweet bouncy shrimp that was well-seasoned. Another crowd-pleaser was the Chicken Wings, in particular the Chili Basil version. 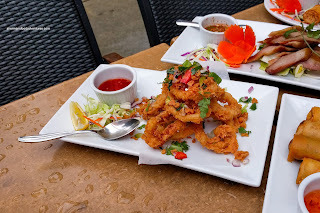 These were fried beautifully with well-rendered skin that was crispy, even after being tossed in sauce. Inside, the meat was tender and almost juicy. 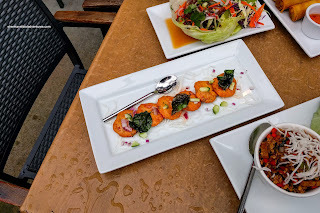 Sweet, slightly spicy and aromatic, the chili basil was addictive. The other options were red curry and sweet & sour. I thought they were good, but the chili basil had flavours that popped more. Staying with fried, we had the Crispy Fish with spicy mayo. This was another favourite of mine as the fish was flaky and super moist. Coated with panko, the outside was fried until golden brown and lightly crispy. Served on the side was a spicy mayo. 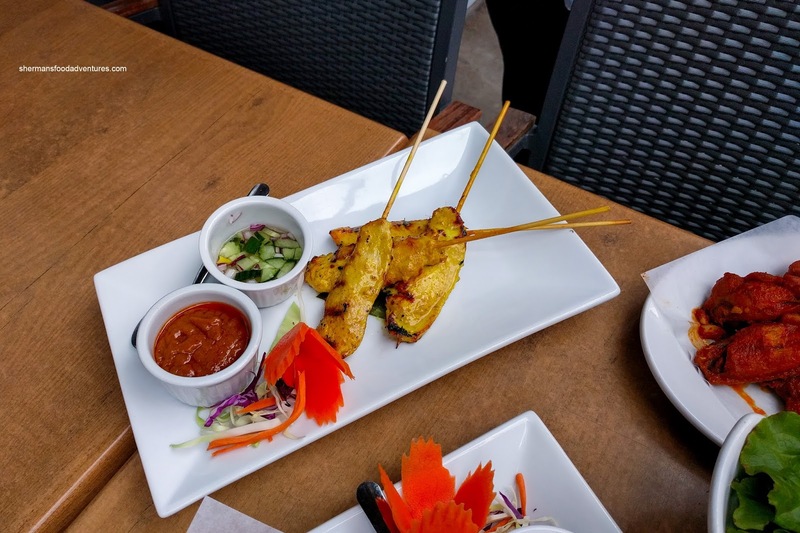 Continuing on, we had a staple on the Urban Thai menu being the Chicken Satay with peanut sauce. As evidenced in the picture, the charring was a bit uneven, but it didn't impact the flavours too much as there was still some caramelized smokiness. The breast meat was marinated so it was still moist and mildly flavourful on its own. The side of creamy peanut sauce added a sweet richness. Aggressively crunchy, the Deep Fried Calamari was still moist and tender. It wasn't too soft though as there was still an appealing chewiness. The batter was seasoned, so they tasted fine even without the sweet chili garlic dip. 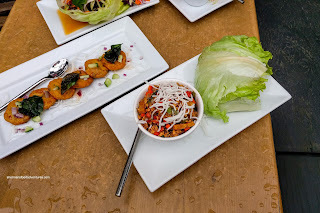 I've never been a fan of too many veggies in my lettuce wraps (I'm a meatarian), so I guess my personal biases would show up with the Chicken Lettuce Wrap. Chock full of peppers, chilis, basil and onions to go with the ground chicken and tofu, it was actually quite balanced. There was a certain brininess from the shrimp paste while the wok heat was sufficient. I still prefer the Peking duck version myself (yes, I realize it is not a fair comparison). Served on lettuce as well, the Spicy BBQ Beef was exactly that. It was a chewy tender (if that makes any sense) where there was a sweet spicy lacquered exterior. There was also some acidity to balance the dish off. There was also a spicy prawn version which was more or less the same with a different protein. Other than the pork and wings, I also really liked the Fried Fish Cakes. These had the requisite bounce texture where the fish mousse was tender and moist. Other than being mildly sweet, the drizzle of sweet chili cucumber salad on top added an appealing acidity. 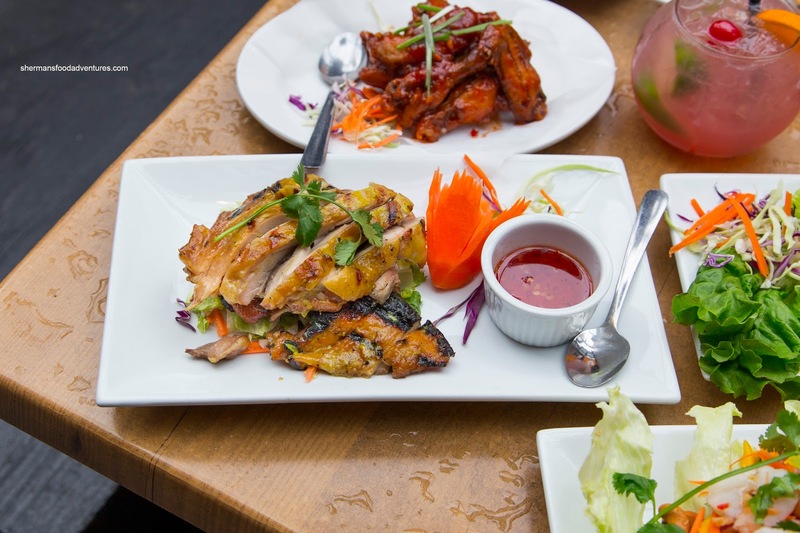 The last dish I tried was the Thai BBQ Chicken sporting charred smoky skin. Underneath, the dark meat was tender and juicy while being mild in flavour. The sweet chili plum dipping sauce added an impactful tartness. 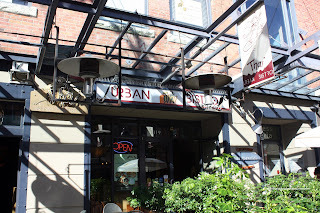 In general, the food at Urban Thai is accessible and good for the majority of patrons. With all things considered, I found the reasonably-priced happy hour menu to be full of appealing eats that were also well-portioned.